The ever vibrant city of Philadelphia can pose daily challenges for an emergency manager, but for 2012 Center for Homeland Defense and Security master’s degree alumna, Sam Phillips, practice makes perfect. 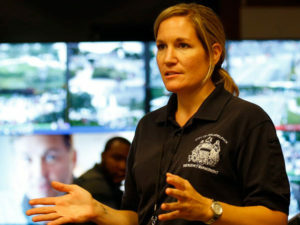 Phillips joined the Philadelphia Office of the Emergency Management in 2007 and for the past five years has been the director of the agency. The past two years have seen an exceptional swell of activity from the unexpected – an Amtrak train derailment and a transit strike among them – to long-planned events such as the July 2016 Democratic National Convention to a September 2015 visit from Pope Francis that drew an estimated 1 million people to the city. The grueling pace is a good thing. The dignitary visits and conventions offer an opportunity to focus on planning, logistics, and collaboration in preparation for a catastrophe later. That notion proved timely during the May 2015 Amtrak derailment. Phillips’ team was fresh from planning for the Papal visit and was amid revising a mass casualty plan that required working with law enforcement, fire, and emergency medical services. “We were so involved in planning for the Papal visit that we already had these incredible relationships that we could leverage during the derailment,” she recalled. While there are few “average days” for any emergency manager, the job in Philadelphia carries some ongoing challenges. First is the core mission. Is the team fully prepared for an unexpected crisis? Has it bonded with the necessary peer agencies? The department and its partners need to evolve and be ready with the best resources possible in order to fully manage an unexpected crisis. Coupled with the operational challenges are budget and bureaucratic boundaries common to government leadership. The city is transitioning to performance-based budgeting. As any experienced player in homeland security well knows, preparedness and deterrence don’t easily mesh with fiscal metrics. Another consistent priority is ensuring staff is at full strength and that the team is adequately trained and exercised to manage the next big catastrophe. “How do we evolve and train in a way that makes us, not 29 employees but 29 emergency managers,” Phillips said. Phillips was appointed by former Mayor Michael Nutter and retained in the post by current Mayor Jim Kenney. In announcing his appointment, Kenney commended Phillips’ work in several disasters, including Superstorm Sandy, Hurricane Irene and Tropical Storm Lee. A CHDS master’s degree education has been beneficial in doing her job, especially in areas of navigating response, budgeting and the plethora of writing and documentation the multi-pronged job demands. The curriculum nurtures strategic thinking, Phillips said, and the critical thinking challenge tests one’s prism in how they look at things. Equally important is the alumni network that offers access to a nationwide cadre of homeland security professionals that have a wide range of experiences to draw upon. There are a dozen master’s degree alumni in the Philadelphia region in addition to hundreds across the country.